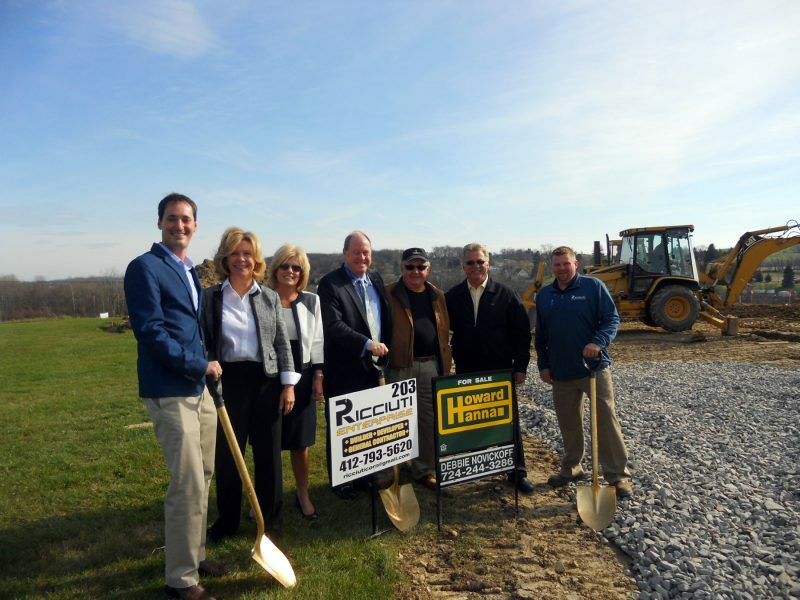 Greensburg, PA (November 18, 2015) – On Tuesday, November 17, 2015, a groundbreaking was held for 26 one-level villas, The Villages at Totteridge, at the planned residential community and golf course, Totteridge. Located north of Greensburg, The Villages at Totteridge project builds on Totteridge Properties’ commitment to developing its residential golf community. Ricciuti Enterprise has been selected as the builder and Howard Hanna Real Estate Services the exclusive marketing agency. With over five hundred acres of immaculate scenery, including the extraordinary golf course, panoramic views offer natural serenity for Totteridge residents. The new villas will be paired, making each an end unit with over 1,700 square feet, three bedrooms, two baths, two car attached garages and covered patios. These maintenance-free homes will share proximity to the Totteridge Golf Course, designed by world renowned golf architect Rees Jones which is currently ranked #25 Best Course in Pennsylvania by Golf Digest. Throughout construction, access to Totteridge Golf Course and Community will be maintained around the site with strict safety measures in place. The initial paired villas will include one that serves as the sales center. Totteridge’s 2020 Vision is to expand the community and premiere golfing destination, and to be a landmark for the Greensburg area. New homeowners in The Villages at Totteridge join a friendly neighborhood with a community pool, a well-appointed clubhouse and an exercise room. Totteridge Golf Course is considered the main amenity of the area, and a new full-service restaurant and bar will open in spring of 2016. Construction for the villas will break ground immediately and the first pair is scheduled to be completed by early next year. Information and homes for sale can be found at HowardHanna.com. Debbie Novickoff, Howard Hanna Sales Associate, is the site coordinator for The Villages at Totteridge. She can be reached at 724-327-5161, 724-244-3286 or debbienovickoff@howardhanna.com. Howard Hanna Real Estate Services is the #1 real estate company serving Pennsylvania and Ohio and the 4th largest real estate company in the United States. The family-owned and operated real estate company specializes in residential and commercial brokerage service, mortgages, closing and title insurance, land development, appraisal services, insurance services, corporate relocation and property management. With 205 offices across PA, OH, NY, VA, MI, WV, NC & MD, Howard Hanna’s more than 7,000 sales associates and employees are guided by a spirit of integrity in all aspects of the real estate process.